And the summer fun begins! There is a little public street that runs off Silver Strand Blvd and leads to the beach close to the Hotel del Coronado. Avenida del Sol. There are a couple of reasons to be aware of this street. First, it's a cul-de-sac that offers free parking with great beach access. 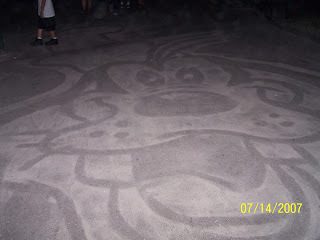 Second, you're likely to see sand art by our very own Coronado Sandman. Yes, yes, that's some at the top of this post! 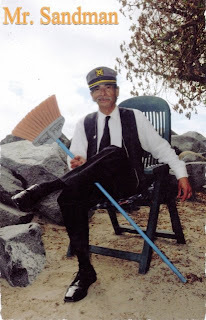 With a broom and a dust pan and sand trekked off the beach to the street, Alberto Avilla AKA the Coronado Sandman creates. He claims his inspiration comes from an angel who speaks to him. If you catch him at work, don't hesitate to say hi. He's friendly and chatty. He dresses in a cap and old suit. 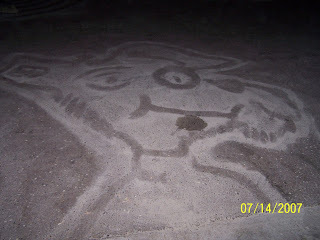 He doesn't have a lot of teeth left, but he loves to design "sand formations" which is what he calls his art. He has received a few citations based on complaints by citizens. 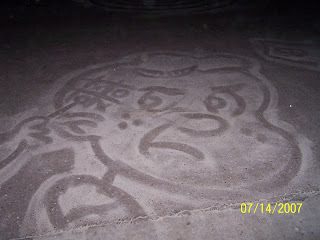 Look for his art on the cul de sac and on the sidewalk leading to the Hotel del. Cars drives over it. People walk on it. The sand pictures are quite long lasting, though. Last week, Child #4 and I were meandering along Avenida del Sol, admiring the sand art. But I'd forgotten my camera. Luckily, my psychic niece (who occasionally comments on this blog) still had the photos she'd taken on her last trip out to visit us. And she emailed them to me. Thanks, Stef! Here they are for your viewing pleasure! You can friend him on myspace. Very cool, Barrie! Next time I'm in San Diego, I'll have to check it out. Thanks for sharing. Mr. Sandman has quite a good style in his drawings. He should be paid, don't you think? Barbara: I do think he should be paid. He's supposedly a resident of Coronado, but I can't imagine where he lives. He looks a step away from being homeless. I love it! Art in public places. We've been to Hotel del Coronado many times, and never once we did happen upon Mr. Sandman, which is a really really big bummer. I'll have my eyes peeled for him next time. He's got such a unique and neat form of art. San Diego is a very interesting place. What a great post! Terrific celebration of this man. what a treasure! I admire anyone who spends time creating something so temporary like that--sidewalk painters too! I've tagged you--it's a fun one for a writer like you I think. He can't be homeless if he has internet and facebook and myspace. Can he? Wow, these looks like the ultimate 'crop' circles! To envision something like that in your mind and then creating it on such a large surface is amazing! This really makes me wonder (and imagine) what his life was like before this. Was he a child who doodled in the margins of his schoolwork? Was he an illustrator or cartoonist? I'm guessing he doesn't have images that he is copying but is pulling these pictures out of his head, his memory. Thanks for this. Travis--I'm not sure that he actually maintains the myspace and facebook. When I met him, he gave me his "business card" but it was really someone else's business card with his (the Sandman's, that is) supposed website jotted down. The website doesn't exist. I don't know exactly what to think of him. Hmm....maybe there's a mystery there! I may be coming to San Diego in January. Yay!!! Think about the happiness Mr. Sandman has brought to millions over the years. What a reward! Thank you for this article. It's exciting in the extreme. Lovely pictures, mysterious artist. It has everything. Gentlemen, start your pencils! My husband and I met Sandman yesterday. He is quite a character! Very positive, upbeat and totally into what he's doing. Turns out one of his dreams is to send sand birthday wishes to each indivual member of the Obama family, have them see it via the webcam and get an invitation to the White House. I think in this day and age his dream can come true! Barrie- thanks for the link so we can keep watching the Sandman's progress via the internet. 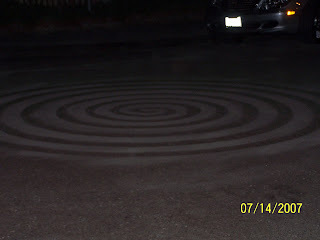 I was thrilled to see the Sandman's work here in Phoenix this morning via the internet. Another reason to love San Diego! I love the people who endeavor to add beauty and humor to our world . . .
How cool. 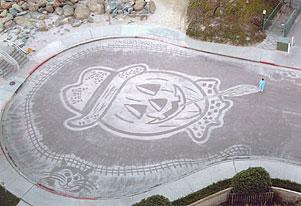 I've been to Coronado a number of times and never seen any sand art, but maybe I just didn't go down the right street. Next time. I will be visiting my dad, the Sandman this weekend. I enjoyed reading all of your comments. I am very proud of my dad and love that he does something he enjoys! Hmm Well I was just searching on Google for some psychic readings and psychic articles and just came across your blog, generally I just only visit blogs and retrieve my required information but this time the useful information that you posted in this post compelled me to reply here and appreciate your good work. I just bookmarked your blog.